David Newman, Head of Global High Yield, discusses the underlying factors that drive and drag the performance of the global high yield market, how he sources opportunities and what investors should consider when looking at this asset class. Hello, my name’s David Newman, and I’m in charge of the global high yield strategy at Allianz Global Investors. I’ve been in charge of the strategy since its inception in 2009, and I work with a team of three other portfolio managers, each of which has got over 20 years’ experience, and a research team of 18 people around the world looking for opportunities in Asia, emerging markets, Latin America, North America, the UK and Continental Europe as well. Our global high yield strategy is benchmarked against the Merrill Lynch Global High Yield Constrained Index. However, despite having an index to outperform, we’re very active in how we manage this. We will take active views on whether we want to be in the European, sterling or US high yield markets; active views on whether we want to be in BBs, Bs or CCCs; active views on whether we want to be in certain sectors or not; and active views on whether we want to be in certain names or not. Right now, for example, of the 30 biggest names in an ETF, we only own six of them, and in fact we’re underweight every single one of those as well. What we try to do is find the very best opportunities around the world which will outperform our benchmark. So we could say that we are aware of what is in the benchmark, but we’re certainly not constrained by it. The high yield market in the end always gravitates towards two things: (1) expected default rates and (2) volatility. The high yield market is a high beta market, so when volatility spikes typically what you see is that high yield spreads spike as well. If you look at high yield returns over the last 30 years, there are two things which you can break down on the spread: (1) is your default premium, what are you going to lose and how much are you going to use if that happens; and (2) is what people often call the illiquidity premium, and this is an amount you get paid because of uncertainty of the high yield market. In the end you typically get a coupon, but in any one year you very rarely do. And what we’ve seen in our analysis is that (1) the illiquidity premium is highly correlated to equity volatility and (2) that high yield spreads typically predict an increase or decrease in default rates by about nine months. So what we need to do as portfolio managers is have a view (1) on credit fundamentals and (2) where volatility is going. Our investment approach is very active. We start with a top-down view of the world. We have an asset allocation meeting every six weeks, not just using the high yield team but all the resources of global fixed income, and taking some inputs in as well from the broader Allianz Global Investors network as well. From there we try to work out where the sweet spots are going to be in credit, and we’ll try to focus on those sweet spots. So that gives our analyst team a great guiding point to where to look for opportunities around the world. And we source all of our opportunities internally. We don’t use third party research to get there; our analysts do their own work. They will know what the portfolio’s looking at, and come up with recommendations which they think will go and beat our benchmark returns to allow us to outperform no matter what we’re investing in. There are three types of risk within the high yield markets. One is liquidity risk, one is market risk and one is idiosyncratic risk, and we have to think about all three of those. The first one is market risk. Market risk is the risk of underperforming or outperforming the market by having too much or too little beta in the portfolio. 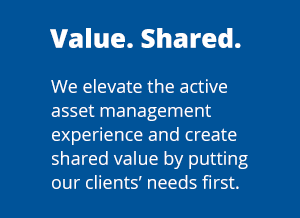 Our job is not to go and allocate beta, but to give our clients the return of the asset class. So we typically manage the amount of risk over or below the benchmark risk in terms of what we call weighted duration time spread, and we’ll never have more than 10% more or less risk than the market at any one time. So the second risk that you have to look at is liquidity risk. What you want to do is have a well-diversified portfolio. Typically we have around about 150-odd names in our portfolio. We also have a limitation on the smallest issuers. We have a limitation on percentage of the issue size which we own. We typically never own more than 5% of the issues. And also we don’t own more than 3% of any one issuer, although that would be a large position in the portfolio. We have a number of analytical tools that can allow us to look real time to make sure that our portfolios are as diversified and doing what we expect them to do. I think the biggest differentiation in our strategy is that we start with that top-down view, which I mentioned a minute a minute ago. So that top-down view really focuses the analysts on looking for credit sweet spots. So we don’t be blindsided by headwinds which can destroy the very best analytical work. Having identified these sweet spots, we also have a very rigorous bottom-up process as well. So we look at all the scenarios around the business. We think like a shareholder. We think about what the shareholders are going to do and whether it’s good for us as bond holders. We think about who else is involved in the capital structure, and we will think about who else is involved in the industry and what that could do to the business as well. If there are a number of fundamental crosses which we don’t like, we won’t buy the credit even if it fits into our top-down view. So, despite having a lot of direction coming from our top-down views, bottom-up always overrides top-down. So if we don’t like a credit fundamentally, just because we have an asset allocation committee saying you should own type of business X, we won’t do so. And I think it’s really that real interplay between top-down and bottom-up that creates very strong conviction ideas which then go into the portfolio. So I think it’s a real interplay between the top-down and the bottom-up that really gives us a strong conviction credit view. Well the first thing I’d say is that it’s not definite that rates are going to rise that much more. So there are a number of issues going on in the world, such as whether the Phillips Curve is breaking down, whether governments can afford much higher interest rates, which could be a cap on how much higher interest rates go. So let’s take the assumption that rates are going to rise. So what we did in our analysis is looked at the impact of rising rates and what does that do to high yield spreads. So the first thing is that the 10-year has very little impact, so we’re really looking at the frontend fed funds rates. And what we’ve seen is that typically after a 3% absolute rise in rates, we start to go and see high yield spreads begin to widen. We then developed that further and said well is it the increase in rates which has been the problem or is it something else? And what we actually saw is each time spread widened, yes fed funds had risen, but there were other issues. There was the Russia crisis, there’s a dotcom crisis, there’s a great financial crisis and there’s the large oil selloff in high yield markets. So it’s not actually proven that rising rates can go and hurt high yield markets so much, it may be something else, that rising rates are the beginning of a change in economic cycle. But how do you deal with it? Not everything is going to do badly because rates rise. Banks do OK as long as defaults don’t go down. And other businesses which have got a lot of interest coverage or have extended all the maturity profiles out a long way can still do well as well. So some further analysis we did is that typically the CCC sector is most exposed, some of the lower Bs, and that shouldn’t surprise you because they are the most levered, and there are some sectors like retail and healthcare and utilities which have more interest rate risk than a number of other sectors. So what can we do as a global manager? We can go and buy credits in geographies where rates aren’t rising. That’s easy. We can buy less CCCs if we’re worried about rising rates, and we can buy less in those sectors which will get impacted by rising rates, unless of course there’s a positive factor to offset that. I think you have to think about whether high yield is a good investment in a portfolio generally. And if you look at risk-adjusted returns of high yield since 1993 to today, high yield gives you better risk-adjusted returns than government bonds or equities. That’s a pretty strong statement. If you look at high yield returns over a long period of time, yes there are periods where they give you large negative returns. But if you don’t panic and sit there longer term, they always come back again. So over that long 30-year period high yield gives you that coupon. The key thing is not to panic and try and gain the market and sell it before it may or may sell off, and buy it before it may or may not recover. It should be a longer-term strategic asset class which you put as part of your portfolio in the same way as you do equities and bonds. And of course if we can provide better returns than the asset class itself through strong active management, that’s even better.